Easeflex Plus for Dogs Tasty Chews are soft textured chews that offer a tasty way to soothe stiff joints and maintain mobility. Loss of mobility through reduced joint function is common in older dogs. The use of supplements to help support joint function is well established. Younger active dogs, as well as those at risk of breed influenced reduced joint function, may also benefit from early joint support utilising Green Lipped Muscle. Green Lipped Muscle contains high levels of Omega 3 Polyunsaturated Fatty Acids (PUFAs) which structurally mimic Arachidonic Acid metabolites. Easeflex Plus Chews are specially designed to provide a treat like appeal to your dog, being the right shape, texture, aroma and flavour to satisfy most pets. Use as part of a weight and exercise management regime. Ingredients: Glucosamine Hydrochloride 600mg, Green Lipped Muscle 500mg, Chondroitin Sulphate 200mg, Manganese Ascorbate 77mg, Vitamin E 50 iu. I was recommended to try this product as my dog is very fussy! the only way I can get anything down him is by giving the tablet in cheese, he is on a diet! 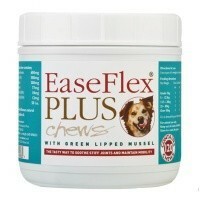 I tried easeflex plus, as there are only 21 cals a chew, and because he is over 30kg he only needs 1 chew a day vs 2! he loved it, I don't have to disguise the tabs any more(arthrotabs) and he takes it like a treat! he is actually looking more mobile now than he was on previous joint supplements - I LOVE IT!!!! !